For the third week in a row, Kate Gosselin and her partner Tony Dovolani were saved to cha cha cha again on ABC's "Dancing with the Stars." The couple survived not only elimination, but even the bottom two, thanks to the viewers' votes. Tuesday night's bottom two actually included another reality star – former "Bachelor" Jake Pavelka and his professional partner, Chelsie Hightower, as well as former astronaut Buzz Aldrin and his pro, Ashly Costa. It was the former moon walker and his partner, however, who received the bad news. "I did this show for the fighter pilots out there, the military people and the elder geezers like me who would just like to see an elder come back week after week," a disappointed Buzz said after learning the news. 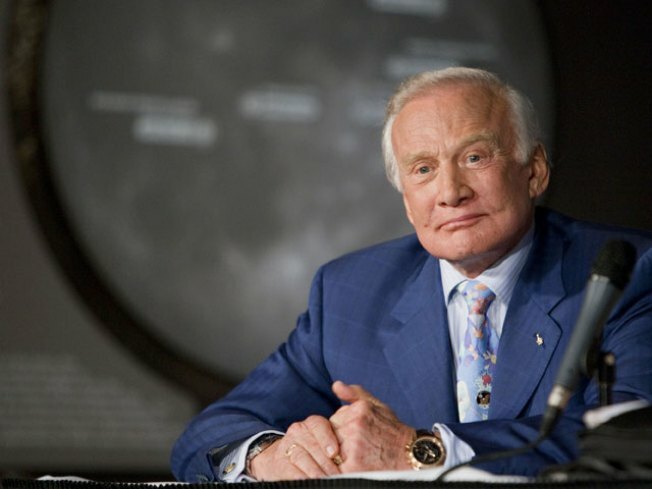 The American legend said he was glad to have been on the show to put a focus on the space program. "I'm interested also in having the public be thankful for the great success we had in the Apollo program and look forward to even greater successes in our future space program," he said. "That's why I came on board — to take the challenge and take the risk and I thank everyone who voted for us." As for the remaining contestants, including leaderboard topper Evan Lysacek and partner Anna Trebunskaya, and blonde bombshell Pamela Anderson and her partner, Damian Whitewood, the competition will heat up next week. Starting Monday, each star will receive two scores for their dances, judge Len Goodman revealed. One will be for the pairs' technique, while the other will be given for their performance. "Season 10 is turning into 'Season Ten-sion,'" Len laughed. Chad Ochocinco, who revealed he is dancing the rumba next week with partner Cheryl Burke, said he'll be bringing the heat. "The rumba is the dance of love, so why not just make love on the dance floor," he smiled.